As most K-pop fans are aware (thanks in no small part to Leeteuk‘s months-long whinefest of a grand farewell), male celebrities in South Korea face a unique restriction on their careers: they must fulfill nearly two years of mandatory military service, and it must be completed during what many would consider to be the prime of their youth and popularity (generally, at some point in their twenties). By virtue of their fame, many celebrities wind up having an easier go of it than do most soldiers; serving chiefly as outreach/public relations officers, many celebrities wind up escaping the harsher tasks delegated to ordinary active duty soldiers (like shoveling snow until the DMZ is clearly visible from a plane). Granted, not all celebrities opt to take what many would call “the easy way out”; Hyun-bin, for example, went the extra mile and volunteered for the Marines, which is a notoriously difficult branch of service. However, his enlistment was exceptional largely because almost no celebrity in his right mind would choose to suffer more when they could spend their year and ten months acting in plays and performing to “boost troop morale” (which, let’s be real — is a performance by some dude really going to do as much for the grand majority of the soldiers as would a performance from, say, KARA?). Which makes it completely baffling, at least to this writer, that soldiers whose jobs are already so unbelievably cushy wind up getting themselves into hot water with the South Korean public by breaking rules — or at least appearing to, which is enough to stir the pot and create media speculation that inevitably devolves into hysterical mudslinging. The latest culprit? None other than the ninja assassin himself, Rain, who is currently under fire for abusing certain privileges extended to him as a celebrity. Rain enlisted (after delaying until pretty much the eleventh hour) on October 11, 2011. Though he originally intended to serve as an active duty soldier, he was tapped in February to become an entertainment soldier, a role that carries with it a number of perks. Most obviously, designation as an entertainment soldier would exempt Rain from doing pretty much anything related to combat or defense maneuvers, but entertainment soldiers (and any soldiers that are members of the Defense Media Agency of the Ministry of National Defense) also have a unique set of privileges that allow them more time off base than other soldiers receive. 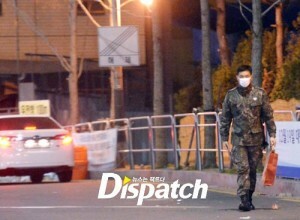 Given that their duties in promoting the military all across the country may take them far from the base in Yongsan (which is located in Seoul), overnight stays off-base are permitted, and many celebrities do indeed spend a good deal of time involved in activities away from base. However, Rain is under fire for potentially abusing this privilege, and the numbers don’t look spectacular. In 300 days as a member of the Defense Media Agency, Rain took 71 vacation days: 44 official overnight stays, 17 stand-down days, and 10 unofficial overnight stays. While serving as an active duty soldier, he took 25 vacation days, bringing his grand total up to 94 days away from base. If one were to average it out, he essentially took a vacation every 4.22 days. As mentioned (and in Rain’s defense), it isn’t totally abnormal for celebrity soldiers to be out and about, but a closer look at the numbers sinks Rain’s case a bit: out of his 44 official overnight stays, 25 were in Seoul — and though it has been pointed out that he was using these days to practice choreography and record music, it has also been stated that he was unaccompanied by superiors on many of these outings and often failed to return to base when he was supposed to. The defense offered here is that studio use is expensive during the day, but I don’t buy this for a second; surely the Ministry of Defense has enough cash to book a studio during business hours. All in all, Rain’s goings-about in Seoul have prompted enough suspicion for the Ministry of Defense to launch an investigation. Complicating matters is the recent revelation that Rain is dating drama megastar Kim Tae-hee. 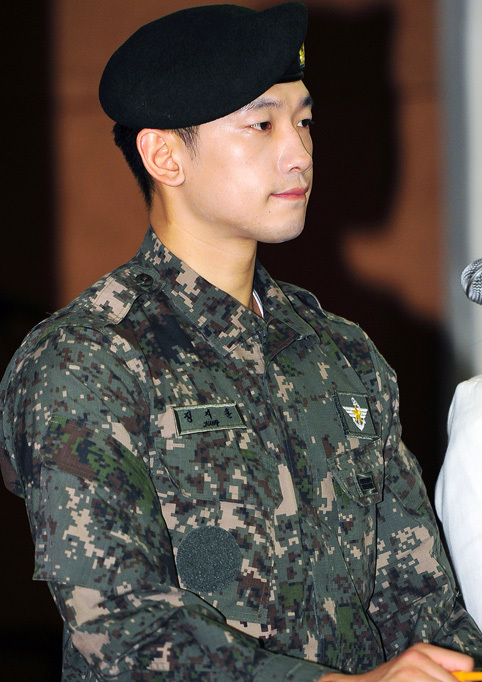 Given that a large chunk of Rain’s official overnight stays off-base took place in Seoul, this has led to speculation that Rain abused his privileges in order to hang out with his ladyfriend — a particularly egregious offense, due principally to the fact that lots of young men in the military left behind girlfriends that they can only see a few times a year (and given that soldiers are not permitted to have their own cellphone on base, communication with loved ones isn’t exactly simple). To make matters even worse, he was photographed off base without his hat — and though this may seem like a trivial matter, as a public figure who is supposed to be promoting the military as a member of the PR squad, it doesn’t look good. Nor does it do him any favors as the South Korean public grows increasingly heated over his perceived indiscretions. Currently, it is being reported that a few online commenters have even suggested that he be made to repeat his military service as did Psy, who was similarly accused of using celebrity privilege to breeze through his military service. As I mentioned in an earlier article about MC Mong, military service is simply not something to be screwed around with in South Korea — and for celebrities who do not toe the line, the public can be pretty unforgiving. Criticism of Rain’s actions is not necessarily the product of an unreasonable lynch mob — quite frankly, complaints that celebrities are getting off pretty easy in the military are legitimate. It isn’t totally impossible to understand why South Korea would invest in a large PR arm of the military; compulsory military service increasingly does not sit well with millions of young men who did not live through the horrors of the Korean War, have little to no connection or experience with North Korea, and who do not necessarily dream of reunification. Despite the rhetoric surrounding the military, enlistment is often regarded as a necessity rather than a patriotic act, something that all able-bodied males just have to put up with for two years of their prime. Making military service look appealing — and motivating soldiers to see their service as meaningful and for the good of the country — is no doubt critical. However, the PR squad is not an actor’s guild; its members are still soldiers. There is no good reason why they should not be held to the same rules and restrictions as are other soldiers, and certainly no good reason why celebrities who find themselves in this branch of the service should make matters worse for themselves by giving anyone any reason to point the finger. Everyone knows that celebrities in the military do almost none of the tasks that make life in the military miserable for regular soldiers; why call more attention to this undeniable fact? In this regard, Rain’s actions have been foolish — and this remains true whether he is found guilty of any sort of violation or not. Regardless of what becomes of Rain, things don’t look good for the rest of South Korea’s celebrity soldiers. The Ministry of Defense will almost certainly have to answer to an increasing number of citizens who are calling for a reduction in the amount of time that they are allowed off-base. Less coddling and more equitable treatment of celebrities in the military is something that probably ought to have been addressed a long time ago, but thanks to Rain, it looks as though it will get its due quite soon. Rain may be a beloved public figure, and he and other celebrities may be well-known, admired, and talented people, but gods they are not. Unfairly rewarding celebrities for being celebrities in an institution that is supposed to promote respect for the well-being of the unit above the individual is absurd. Celebrities often complain that they want to be able to live like an ordinary person — and if this is true, then they should learn that sometimes, being an ordinary person requires doing things that you don’t want to do — like joining the millions of other young men who are sacrificing some of their best years for their country, for example. Readers, have your say. 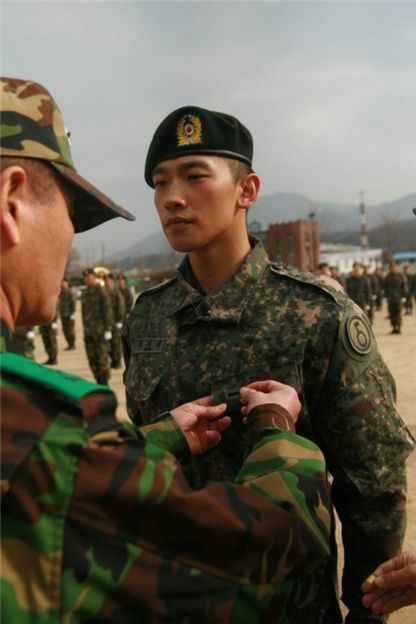 What do you think about Rain’s scandal?